With more than 20 years of experience in aesthetic medicine, Dr Lola has carved a reputation as one of the best laser therapists and anti-aging experts in the Middle East and Europe. 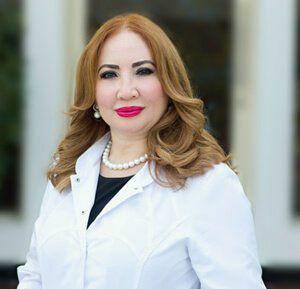 After completing a six-year doctorate as an Obstetrician Gynecologist at Almaty, Kazakhstan State Medical University, Dr. Lola’s interest turned to aesthetic medicine, which led to her pursuing more studies in this area at the prestigious “Education Centre Elida” in Moscow. With her medical degree and her qualifications in aesthetics, Dr. Lola decided to gain more training in mass cosmetics and skin care treatments; undertaking courses in Paris, New York, UAE, and Moscow. Today, her unrivaled knowledge in the field of aesthetics has made Lola a master at performing laser therapy techniques including photo facials skin rejuvenation. Her background in diagnostics and ultrasound has also contributed in her being the absolute expert who can prescribe the best possible treatment to alleviate your skin concerns, where it is acne, stretch marks or cellulite removal. Due to the evolution of medicine, Dr. Lola constantly attends training in the field of aesthetics in order to deliver the latest and most effective skin treatments and anti-aging techniques to her patients. Her treatment specialties include Anti-aging treatments, Acne treatment, Bio-Revitalization, Face and Body Mesotherapy procedures, Soft Tissue Augmentation, Chemical Peelings, Thread lifting, Plasma-lifting, Microdermabrasion, Micro-Needling, Semi-Permanent Make-up, Gold Facial to name but a few. Dr. Lola has worked alongside the best in the industry, as well as taught up-and-coming cosmetologists the secrets surrounding beauty and aesthetics and we are delighted to have her working at Rebecca Treston Aesthetics.